Yes, billion, with a B. In June of 2017, that is how many active users Facebook exceeded according to Statista. That amount is staggering, and the awe tends to compound when you hear that over 65% percent of that amount use Facebook daily. Wouldn’t you like a slice of over 2 billion users? 1 percent of that amount and you’re looking at more than 20 million users. … and your wallet, too, hopefully. While we can’t promise that this guide will give you that much traffic, we can tell you that gaining traffic from Facebook is not impossible, though it seem that way. The fact that you’re already reading this means that you likely understand the power that Facebook has as a social platform. Many brands and businesses — small and large — have experienced the power of going viral and building a loyal fan base on Facebook. One example of a brand that knocks it out of the park is The Penny Hoarder. With over 5 million followers, they have a huge audience that makes it easy for their content to gain a ton of traffic and to go viral. While very few marketing methods trump email marketing, Facebook — when done correctly — can be one of the best ways to build your brand and take your business to a whole other level. And combined with email marketing for even better results. Obviously, each business has different needs and things that will work for them better than others, but Facebook isn’t something to be ignored. Even though growing your business page Likes can be long and hard work, it’s a space that can pay off in the long run. Before you go off and start implementing any kind of strategy, you first need to clean up homebase. That is to say — you should start with your blog and branch out from there. Note from Adam: Before trying any of these ideas you need to consider your goals and which marketing channels are going to help you achieve those goals faster. If email marketing is more important to your business, the following will only distract people from joining your email list. In that case, you may want to skip to the next section and opt for a slightly different approach. For example, what I like to do is make sure my Facebook page can be found somewhere on my blog – e.g. in the footer. Then encourage readers to like my Facebook page after they’ve subscribed to my email list. You could do this by including a CTA at the end of each of your emails and/or adding a specific email about it to your automation sequence. That said, if Facebook is more important to your business, the following ideas are well worth considering. It’s becoming increasingly evident that in today’s internet age, sidebars tend to be entirely ignored by the average viewer. However, it has potential that shouldn’t be forgotten. Something as simple as this Easy Facebook Like Box can help you easily grab likes to your Facebook page. Most of these Like Box plugins are simple enough to set up and easily integrate as a widget in your sidebar or footer. They tend to stand out as they look different from your average widget and a single click of the mouse makes it a done deal. Plus, your blog readers may not even know that you have a page on Facebook, so having something there just makes it that much easier to get them to follow you. Calls-to-action come in many forms on the web, but they’re effective. If you want your readers to follow you on Facebook — tell them that is what you want from them. Like this post so far? Follow us on Facebook so you never miss out. It’s easy to do, don’t ya think? Trust me, I hear you. But there are ways to use them and notification bars in a way that’s not super annoying and that can add a touch of warmth to your site. If you want to learn how to do that, then you’ll need to keep reading to the end of this point to learn a nifty trick. It’s important, and a must-do (obviously *wink*). But you can utilize this to help increase your Facebook page likes. Step One: Create a Thank You page. In that page, create a call-to-action to like your Facebook Page. Make it big, make it prominent. Step Three: Connect your notification bar to take your user to the Thank You page after they’ve signed up to your list. To drive the incentive to like your page you can use the SocialLocker plugin to hide another PDF or video that will encourage them to like your page (I’ll explain more about this plugin in a moment). This is pretty much like killing 2 birds with 1 stone. Now, I mentioned before about a way to use both notification bars and pop-ups in a way that was less annoying that average and that still boosted conversion. You do this through a method called web personalization. This is where you personalize content on your site depending on your user. One example of what I mean by this is to create something like a pop-up or notification bar that is triggered to appear based on an event. It’s great to have you back on the blog. Have you seen our Facebook Page? Let’s Connect! Something like this adds an extra layer to the relationship you’re trying to build with your readers and makes them want to click the link over to your FB page and follow. Someone comes to your site from Facebook, perhaps through an ad or from a friend’s post. Hey there fellow Facebook enthusiast. Thanks for stopping by! Be sure to like us on Facebook to stay up-to-date with our promotions and giveaways. It’s the small things that have the biggest impact *wink*. In times past, this and other personalization tricks have been hard to do, but there are WP plugins that make it really easy. The Notification bar by MyThemeShop is a free plugin that can be used to do this. Okay, you don’t have to do this, but you should because it’s kind of awesome. I mentioned it above, but thought this would be a good place to talk about it a little more. This plugin places a lock on content on posts and pages using a shortcode that requires people to either like you on Twitter, Facebook, or Google Plus in order to unlock the rest of the content or to download something particular from your site. This is something to use sparingly, but if you have a knack for making people crave your content, then placing a content lock just when your post is about to get good is a great way to gain some social traction in exchange for giving your readers something really awesome. Don’t be annoying when using this tool, but don’t be afraid to give it try either. … sorry, but it had to be said. It’s understandable that you’re going to want to see results from the effort you put into to growing your Facebook network, but the truth is that is does take time. It’s all part of the bigger picture of building your brand, business, income, authority, and all that other happifying stuff that comes from building an online income. However, you still need to be smart about it and recognize that time and effort do payoff — just not always overnight. With that in mind, here is a list of smart tactics you can use to start growing the like on your Facebook page. After you create your Facebook page, you have the option to always invite your FB friends to like your page. If you have a ton of people you know on Facebook, but just haven’t made the effort to follow them, start doing that now. Most people who know you will follow you back. After they’ve done that, you can invite them to like your page. In many cases, you friends will do it as a courtesy to you and you can grow your page likes easily from there. Though your friends on Facebook may not be your ideal audience for your page, the fact that they know you and the page is yours means that they will likely repost the stuff that you post there. This will extend your reach and help you cast a wider net in the long run. If you’re anything like me, then chances are that you send a ton of emails every day. I know for me, on average, I send out about 5-15 each day. That’s a ton of emails over the course of a month! One way that you can get more likes on your page is by simply adding a link to your FB page within your email signature. My preferred method is to use Wisestamp. It’s free, easy to setup, and makes the call-to-action to follow a page stand out much better than anything else I’ve found so far. This may sound a little silly to say because I’m sure you already do it, but it’s still worth mentioning. Captivating, relevant and even funny pictures make it easier for people to want to share your images. Of course, you should make it easier for people to do so by adding a social media plugin like Social Snap, or Monarch to your site so that sharing these pictures is as simple as a hover and click. So how do you create a picture that people can’t help but share? 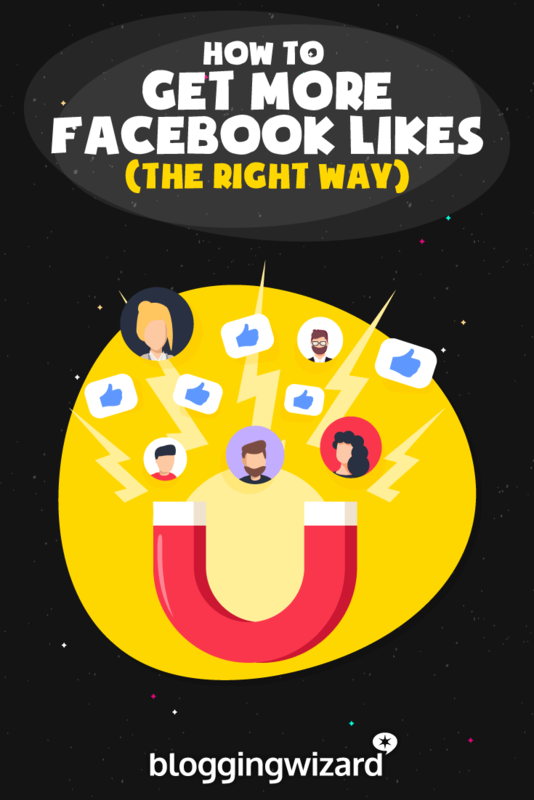 Well, there’s really no single way to do that, but you can copy a method that quite a few do and that does a remarkably good job of getting likes. By creating your own Someecard. You’ve probably seen them on Facebook — everywhere. When they’re done right, these things get likes and shares like no other. You can create these for free directly on their site and then save them and use them in your social media posts. Alternatively, you could use Canva – they have a boatload of awesome templates you can use for free. Grab a surfboard and ride that wave! Commenting on other pages in your niche. Don’t scoff at this one just yet. Think for minute about who is managing those pages. 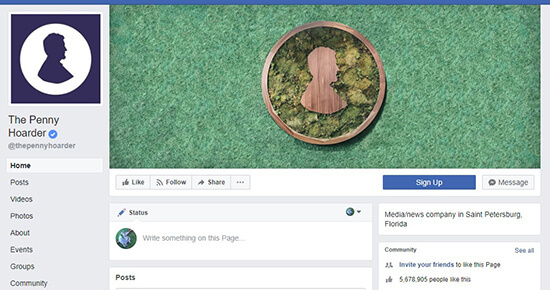 In most cases, the person moderating that page is the very influencer that you would want to make a connection with. Connecting and fostering relationships with influencers in your niche is vital to your online efforts. Commenting on their page, liking their posts, and engaging with their other followers will get you noticed. And if you do this while you are using Facebook as your page, then you raise the chances of getting clicks over to your page and thus, likes. It’s important to add to the conversions on other influencers pages. It will get their attention and the attention of their followers — which is a good thing for you. Lest we not forget the other social media platforms out there. Twitter, Pinterest, Instagram, and whatever other platform that you’re active on. The easiest for promoting your FB page and seeing results on it is probably Instagram. Instagram tends to get the highest engagement of all the social platforms, so if you have a decent sized following there, then start pumping out your Facebook page. Let people know that it exists. Use calls-to-action in your images or description to like your page and change your bio link to make clicking over to it a simple procedure. No one likes a person who only talks about themselves. Those showboating types really just make people want to kick them in the shins. While you’re likely not that type of person, the content you’re posting could possibly make you comes across that way. If all or the majority of what you post is promotional, then you could be unintentionally annoying others and dampen your growth. A good rule of thumb is the rule of 80/20. 80 percent of what you post should be non-promotional or promotes other people’s content, and then the other 20 percent can be all you, baby. I work as a social media manager too, so trust me — I know how you feel about them. But at the same time, hashtags are an essential part of any social media strategy. That includes posts to Facebook. Unlike Instagram, where posts with 11 hashtags get the most engagement, Facebook does best with 1 to 2 hashtags per post. PostPlanner noted that while 1-2 hashtags brought in the highest engagement adding an additional 2 to a post saw a significant drop in engagement, so less is more on this platform. The approach, then, when using hashtags should be relevancy. Therefore, you don’t want to go crazy with these. There’s no exact science to this, but it’s definitely worth the try. Your best bet is to do a bit of hashtag research, use a relevant one in some posts, and then measure your engagement from those. Okay. Let’s have a little bit of an honest love-in for a second. With the recent updates that Facebook has made, organic reach within the platform has nearly flatlined. That means that, generally speaking, everything you try to do to get likes on your page is going to be much harder than if you pay for advertising within Facebook. 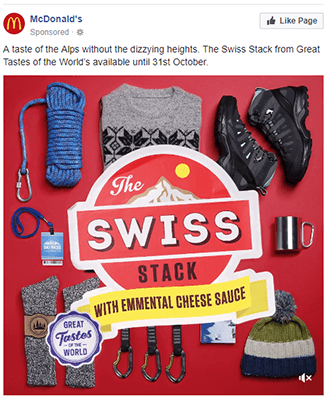 Facebook Ads are not the easiest thing in the world to get right, but they can be well worth your money if use them correctly. If you have a budget for ad campaigns, this might be an area worth exploring. If you’re not an expert in this field, but you’d like to get it done and done correctly, then why not consider hiring a growth hacker who specializes in this? GrowthGeeks has a large database of people who know how to utilize Facebook Ads. You can pay someone for a month of their time or however long you’d like to get this done. Plus, you may just find someone worth keeping on your team. And the great thing is that there are lots of different types of Facebook Ads. You can use Lead Ads to build your email list or you could directly advertise your page to get more likes. Or you could create a custom audience to promote your latest posts to. Note from Adam: When running Facebook ads, it usually defaults to a £20/day limit for me (maybe a similar amount for you, but in your currency). If you click the dropdown box it will show you a much larger lifetime budget. So always click the dropdown box and select the lifetime budget. This will ensure you know exactly how much you’ll spend for your entire campaign. When it comes to paying for ads, YouTube is one of the cheaper options. If you have a budget for your marketing efforts, then why not give this a go. Growth Hacking Mentality 101: Don’t be afraid to try something unorthodox. Sure, a lot of people may not be using YouTube ads to get Facebook likes, but that doesn’t mean it’s not full of potential for doing just that. Obviously, you shouldn’t go blow a ton of cash in this endeavor. Everything is run through Google AdWords and thus, there is a need for strategy with this. This post can help you get up and running with a YouTube Ad campaign. As far as I can tell, YouTube Ads run similarly to Google Ads when it comes to how they are graded. As that is the case, you’ll want that click-through in your call-to-action of the video to connect to a landing page that is relevant to the keyword you’re targeting. The idea of this as a whole could be just a good move for marketing and it’s definitely something I’m planning to explore. Running a giveaway on Facebook is a great way to generate buzz about your brand and to get more people to your page. Back in the day (like a year ago) people could run a contest on their blogs that allowed them to make liking a Facebook page as part of the way to enter a contest. Facebook has changed it’s policy about this and now no longer allows this. Though you could indeed sidestep it and do this anyway, I wouldn’t recommend it. Facebook can easily shut you down and kick you out for life. You can still run contests and giveaways to drum up buzz, but you can’t make liking your page an actual part of contest entry. However, it appears that a call to action to simply like the page might be acceptable as long as it’s not a requirement to enter. And if you want to find out which tools you can use to run contests and giveaways, check out this post by Elna Cain. These tools will support Facebook and other networks – awesome! Another great way to get likes to your page is to use your guest posts to your advantage. Most blogs allow you to add your social profiles to your Author Bio. If gaining more likes on your FB page is a goal, then use a call-to-action (CTA) to follow your page for more content. If you’ve gained access to blogs that use WordPress in the past but didn’t add that CTA before, you can ask them if you can add it to your bio in the posts you’ve made in the past for them. Most of the time, they’re more than happy to do it for you. When it comes to posting on Facebook, it’s easy to get in the same routine of sharing relevant content to with your readers. However, funny stuff often gets the most likes and shares. Grammarly is a great example of a brand that takes grammar seriously but also knows how to turn it into a joke. You can do something similar by sharing funny images that your audience would relate to and might tickle their funny bone. Because current events are what will be on people’s minds; they’re relevant to them right now. Posting on Facebook while mentioning current events is a way to get some attention, staying current, and not being too promotional. Obviously, this suggestion covers the topic of current event in a general sense. You’ll have to use good judgment when talking about current events, too. Some topics might be too sensitive to be a topic for your post. Stay current, and use current events to your advantage when applicable. There’s really no cut and dry method for doing this, so just be as innovative as you can. Facebook has changed quite a bit in the past couple of years, and the updates to how it works and how to market on it will continue to change as time goes by. Even still, we’ve tried to cover as many sound methods for gaining as many page likes as possible. Now, it’s important to remember that this is just the beginning. Once you’ve grown your audience on Facebook, you need to keep them engaged. That’s where increasing Facebook organic reach comes into play – big time. But that’s another topic for another time. And when you’re ready to grow your audience on other networks, be sure to check out our posts on Pinterest, Instagram, Tumblr & Twitter. Each detailed guide will help you get more followers. Ariel is a freelance blogger for hire and online marketer. She enjoys copious amounts of coffee, eating too many cookies and watching way too much TV. When she's not writing on her Mac, she is spending time with her amazing boys.